Concept of trace elements being “the Inorganic Switches” has evolved during last several decades. Ayurveda, the traditional Indian medicinal system also emphasises the importance of minor and trace elements in human health and disease. To evaluate elemental contents of some commonly used to cure general weakness, 3 medicine herbs namely Beezband (seeds), Gokshur (fruit) and Talmakhana (seeds) have been analyzed for four minor (Na, K, Mg and Ca) and eight trace elements (Cr, Mn, Fe, Co, Ni, Cu, Zn and Cd) by atomic absorption spectrometry and flame photometry. Their accuracy was measured by replicate analyses. In general, elemental contents were found in varying amounts with large range. It is observed that many of medicinal herbs are enriched in one or more elements. Since these elements are bioavailable in natural form, probably in combination with organic constituents, these are likely to be easily assimilated by human Bodies. Besides them, two toxic elements Ni and Cd were also found in insignificant amounts as these are likely to have originated from environmental contamination. There are ample evidences of herbs being used in the treatment of diseases and for revitalising body system in almost all ancient civilizations [1-5]. Plants were the mainstay of many medicines having mystical and almost super natural healing power. There are many references to the curative properties of several herbs in the ancient Indian literature, Rigveda, though a more detailed amount is found in the Atharvaveda from where Ayurveda, the Indian traditional health care system (ayus = life, veda = knowledge, meaning science of life) originated. Fairly compreshensive information about herbs has been recorded [6,7] in two treatises Charak Samhita and Shusruta Samhita—a base for Ayurvedic system of medicine. Looking to the importance of herbs, A Compendium of Indian Medicinal Plants in six volumes has been published . Herbs play a significant role in modern times, when the damaging effects of food processing and over medication have assumed alarming proportions. These are now being increasingly used in cosmetics, foods as well as alternative medicine . Besides lipids, proteins and carbohydrates required for human growth, supply of optimum quantities of inorganic micronutrients is also essential [10,11]. Several micronutrients such as Cr, Mn, Fe, Cu and Zn etc., constitute a small fraction of our diet and play an important role in metabolic processes. Their excess or deficiency may disturb normal biochemical functions of the body . Two main criteria considered for essentiality of elements are: first, its absence from diet results in departure from normal growth and metabolism; and second, the replacement of an element may suppress pathological symptoms. The composition of biological systems is so complex that the trace elements are totally masked by major constituents, and hence difficult to determine . Some techniques, widely used in trace element analysis  are atomic absorption spectrophotometry (AAS), energy dispersive X-ray fluorescence  (EDXRF), electro thermal atomic absorption spectrometry  (ETAAS), inductively coupled plasma-atomic emission spectrometry  (ICP-AES) and mass spectrometry (ICP-MS). Each one of these has one’s own advantages and limitations with regard to accuracy, precision, sensitivity and specificity. The advent of ICP-AES and ICP-MS all with multi-element capabilities has slowed the AAS/AES market. However, AAS/AES technology is deeply entrenched in the field of analytical chemistry. Several workers from different countries have reported the analysis of medicinal herbs of their respective countries. Lin et al. detected 32 elements in 16 medicinal herbs by ICP-AES. Zhang et al. employing ICPAES for detecting major, minor and trace elements in 26 Chinese traditional drugs and compare their results with those obtained by AAS and NAA. Fan et al. detected Cu, Fe, Mn, Zn, Cr, Mo, Se, B, K, Ca, Mg, F−, Cl− in 13 diverse drugs by mean of AAS and HPLC methods. Shuping and Chen  detected Zn, Fe, Cu, Cr, Co, Ni, Mo, Sr, Cd and Br in seven medicinal herbs by employing ICP-AES. Yuan  detected 16 elements in 6 Traditional Chinese Medicines by AAS. Chen et al. and Xu et al. determined several elements in TCMs by AAS. Wang et al. used ICP-MS for determined metal contents in several TCMs. Zhang  employed FAAS for determining Zn, Mn and Cu in chinese medicinal herbs and drugs used in treatment of kidney diseases. Zhang et al. determined 21 trace elements in 10 TCM samples by employing flame and graphite furnace AAS techniques. Jain et al. [28,29] reported AAS and flame photometric determination of 19 elements in several medicinal plants. Saily et al. [30,31] analyzed about 40 medicinal plants for 18 elements. It has been reported that Na, Mg, Ca, Cr, Mn, Fe, Co and Zn contents were common in many medicinal plants used for the treatment of asthama, rheumatism, diarrhoea etc. Further Sondhi et al. [32-34] have determined 20 elements in Ayurvedic bhasmas (medicine) used for the treatment of bronchitis, kidney and bladder disorder, skin diseases and Gonorrhoea by employing AAS, ICP-AES and flame photometer. Arun Kumar et al. analyzed macro and micro nutrients in 5 Indian medicinal herbs by applying FAS and AAS method. In the present study we have attempted to analyse specific parts of 3 herbal medicines which are often recommended as to cure general weakness. Nomenclature and uses of medicinal herbs analyzed in this study are listed in Table 1. All the medicinal herbs were procured from the local market through dealers of herbal medicines. These were cleaned and then swiped to remove all the dust. These were further washed with distilled water and then afterwards swiped with tissue paper. The plant material was first dried in an oven and then dried under IR Lamp at temperature < 70˚C. The dried plant material was grounded to a fine powder (100 mesh) in an agate mortar. The powdered samples were stored in pre-cleaned polyethylene vials and handled with extreme care in a glove box to avoid contamination. Synthetic multielemental standards were prepared by spiking 2 - 5 μg amounts of Cr, Mn, Fe, Co, Ni, Cu, Zn, Cd, Ca, Mg, Na and K in aqueous solution of their respective AR/high purity grade salts. Table 1. Some characteristics of herbal medicines analyzed in this study. For the analysis of Mg, Ca, Cr, Mn, Fe, Co, Ni, Cu, Zn and Cd by AAS method, about 2 g of each sample were accurately weighed and digested in 5:1 mixture of nitric acid and perchloric acid. After digestion, two to three drops of HCl was added and the solution was made up to 25 mL., Ca, Cd, Co, Cr, Cu, Fe, Mg, Mn, Ni and Zn were determined by Atomic Absorption Spectrophotometer (GBC Avanta, Australia) using a mixture acetylene-air flame. The wavelength and senstivities for these elements were 422.7 nm and 4 μg/g; 228.8 nm and 1.5 μg/g, 240.7 nm and 7 μg/g; 357.9 nm and 4 μg/g; 324.8 nm and 4 μg/g; 248.3 nm and 5 μg/g; 285.2 nm and 0.3 μg/g; 279.5 nm and 2.5 μg/g; 232.0 nm and 7.0 μg/g and 213.9 nm and 1.0 μg/g respectively. The instrument was precalibrated using high purity grade salts of respective elements. Table 2. Elemental concentrations in medicinal plants. 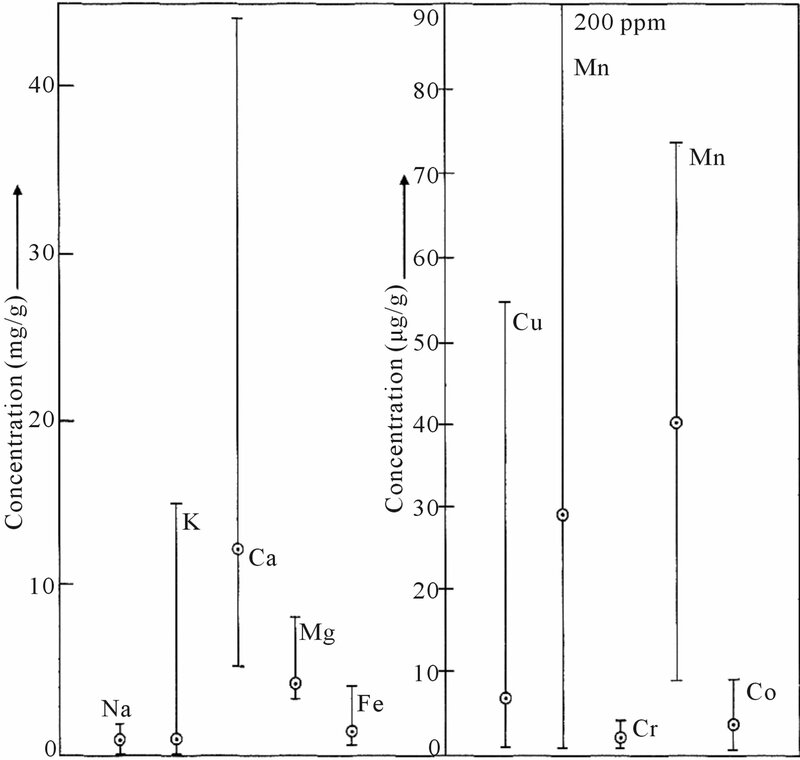 elemental concentrations of 3 medicinal herbs for Na, K, Ca, Mg, Fe, Cu, Mn, Cr, Zn and Co are plotted in Figure 1. The herbs of Jaunpur origin are found to contain some rare elements in amounts larger than other places. A perusal of data in Table 2 show that no single herb is enriched in all the elements. The electrolytic elements Na and K responsible for maintaining normal fluid balance inside and outside cells are generally found at minor and major concentration levels respectively. All the samples have shown much higher concentration of K by up to an order of magnitude compared to that of Na. Figure 1. Comparison of elemental contents (rang and median values) in medicinal herbs. K (0.50), Ca (9.6), Mg (4.4) in mg/g and Fe (600), Cr (1.0), Mn (28), Co (3.9), Cu (2.3), Zn (9.0), Ni (40) and Cd (1.0) μg/g. Other plant organs were not analysed as they have negligible medicinal significance. 2) Gokshur: The fruit of this herb contains Na (0.125), K (1.00), Ca (44.2), Mg (8.43) in mg/g and Fe (4500), Cr (2.5), Mn (10), Co (3.7), Cu (3.7), Zn (1.1), Ni (67) and Cd (<1.0) μg/g. Other plant organs were not analysed as they have negligible medicinal significance. 3) Talmakhana: The seed of this herb contains Na (0.125), K (0.05), Ca (13.6), Mg (8.7) in mg/g and Fe (1550), Cr (3.0), Mn (31), Co (0.8), Cu (4.5), Zn (7.6), Ni (51) and Cd (0.1) μg/g. Other plant organs were not analysed as they have negligible medicinal significance. Beezband has highest amount of Cu (9 μg/g) where as Talmakhana has highest amount of Ca (13.6 mg/g), Mg (8.7 mg/g), Fe (1.55 mg/g), Cr (3.0 μg/g) and Ni (9.5 μg/g). Gokshur has highest amount of Fe and Ni and lowest amount of Na. All these are prescribed to patient suffering from general weakness. Interestingly Beezband is used in cardic disorder, seminal debility and urinary stone where as Talmakhana is used in anaemia, rheumatide, sterility and urinary stone and Gokshur is used as health promoter, seminal debility, hair growth promoter. The accountability of different components for medicinal potency may be a search light for physican and dieticians. 1) Different parts of medicinal plants are enriched in some or other nutrient elements especially for Ca, Fe, Mn, Cu and Zn. 2) No particular plant is enriched in all the elements. 3) In general iron is enriched in all the medicinal herbs as there are used as brain tonics. 4) Elemental contents of environmental contaminants are minimal so as not to cause any harm to our body system. The first author (Arun Kumar) grateful to Prof. G. Bhattacharjee, Head, Department of Chemistry, University of Roorkee, Roorkee (at present IIT Roorkee) for providing all the facilities during the course of this work. I am also thankful to all the faculty members of the Department of Chemistry for their timely suggestions and moral support. I would like to express my grateful thanks Prof. Indu Mehrotra, Environmental Engineering Section, Civil Engineering Department, University of Roorkee, Roorkee for permission to use their flame photometer and full co-operation during experimental work. Sivarajan, V.V. and Balachandran, I. 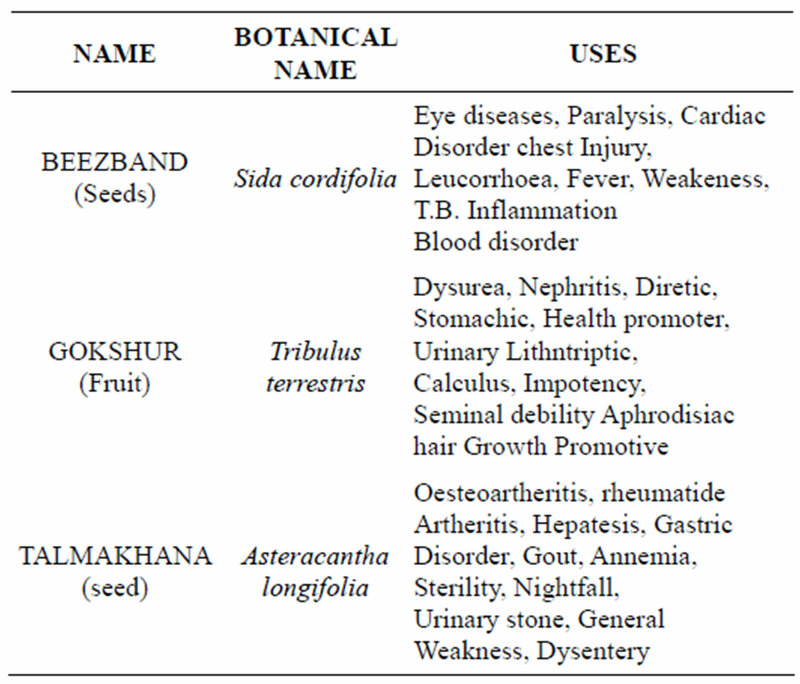 (1994) Ayurvedic drugs and their plant sources. Oxford and IBH Publishing Co. Pvt. Ltd., New Delhi, 570. Zhou, J., Xie, G. and Yan, X. (Eds.) (2003) Traditional Chinese Medicines. Ashgate Publishing, Oxon. Steiner, R.P. (1986) Folk medicine: The art and the science. American Chemical Society, Washington DC, 223. Parchure, S.N. (1983) Charak samhita, Vol. 1-3. Sagar Publications, Pune. Sharma, P.V. (1993) Dravya guna vigyan. Chaukhamba Bharati Academy, Varanasi. Rastogi, R.P. and Mehrotra, B.N. (1998-2002) Compendium of Indian medicinal plants, Vol. 1-6. Central Drug Research Institute/National Institute of Science Communication, Lucknow/New Delhi. Bakhru, H.K. (1998) Herbs that heal natural remedies for good health, Orient paper backs. Division of Vision Book Pvt. Ltd., New Delhi. Prasad, A.S. (1993) Essential and toxic elements in human health and disease; an update. Wiley-Liss, New York. O’Dell, B.L. and Sunde, R.A. (Eds.) (1997) Handbook of nutritionally essential mineral elements. Marcel Dekker Inc., New York. Iyengar, G.V. (1989) Elemental analysis of biological systems-biomedical, environmental in: Compositional and methodological aspects of trace elements. CRC Press, Boca Raton. Seiler, H.G., Sigel, A. and Sigel, H. (Eds.) (1994) Handbook on metals in clinical and analytical chemistry. Marcell Dekker Inc., New York. Herber, R.F.M. and Stoeppler, M. (Eds.) (1994) Trace element analysis in biological specimens. Elsevier, New York. Joseph D., Lal, M., Bajpai, H.N. and Mathur, P.K. (1999) Levels of trace elements of a few Indian spices by energy dispersive X-ray fluorescence. Journal of Food Science and Technology, 36, 264-265. Lin, S., Zhao L. and Yan, Y. (1991) Zhongguo Zhongyao Zazhi, 16, 222. Zhang, X., Duan Y. and Wang, X. (1991) Fenxi Huazue, 19, 835. Fan, X., Chen, Y., He, L., Hu, Q., Shi, Y., Tian, C., Wang, C., Wang, S. and Yang, Z. (1993) Fenxi Shiyanshi, 12, 32. Shuping, H. and Chen, L. (1994) Senxi Daxue Xuebao, 177, 56. Yuan, A. (1998) Guangdong Weiliang Yuansukexue, 5. Chen, X., Cao, S., Zhou, P., Zheng, Y. and Huang, J. (1998) Zhongcaoyao, 29, 808. Xu, X., Yen, G., Sun, G., Sun, X., Tian, L. and Wang, S. (1998). Shizheu Daxue Xuebao Ziran Kexueban, 2, 43. Wang, X., Zhuang, Z., Sun, D., Hong, J., Wu, X., Lee, F., Yang, M. and Leung, H.W. (1999) At. Spectro, 20, 86. Zhang, T. (1999) Zhongguo Yiyuan Yaoxue Zazhi, 19, 345. Zhang, Q.F., Peng, S.S., Ni, N., Hu, X.Y. and Yang, W.Y. (1999) Guangpuxue Yu Gungpu Fenxi, 19, 203. Jain, N., Shahoo, R.K. and Sondhi, S.M. (1992) Indian Drugs, 29, 187. Jain, N., Magan, A. and Sondhi, S.M. (1993) Indian Drugs, 30, 190. Saily, A., Sahu, R., Mohan, D., Gupta, B. and Sondhi, S.M. (1994) Indian Journal of Pharmaceutical Science, 56, 186. Saily, A., Sahu, R., Gupta, B. and Sondhi, S.M. (1994) Hamdard, 37, 18. Sondhi, S.M. and Janani, G.K. (1995) Indian Drugs, 32, 125. Sondhi, S.M. and Agarwal, N. (1995) Hamdard Medicus, 38, 24. Sondhi, S.M., Sharma, V.K. and Verma, R.P. (1995) Indian Drugs, 33, 67.